THE STATE OF THE DRONE MARKET AT THE END OF 2018. Airborne Drones discusses the current state of the drone market and makes some predictions. It is fashionable at the end of a year to review the developments of the past year. Airborne Drones offers its own overview. The biggest stories of the 2018. Parrot had to retract from the consumer drone market having suffered a -24% Y/Y drop, -45% for same Q3 resulting in a departure plan for 100 employees in drone consumer market division. – Having to compete with platforms which included the same functionality on board, which buyers preferred. GoPro exiting drone business. It is believed that it relied too much on contract manufacturers for its drone business. Aerialtronics was declared bankrupt in September 2017 and had to sell majority share to Drone Volt. 3DR failed in the hardware arena and had to retool itself to become a software company. Their sales figures were based on “sell in” to distribution channels rather than “sell through” to customer figures. Other than flooding the channels with stock that was not moving, they tried to compete head-on with Chinese DJI who benefits from having a totally vertically integrated supply chains.In contrast to (at least) some, the Chinese market leader DJI designs and manufactures every product itself and where American companies advertise their products in advance, Chinese companies come in very quiet. The End of the Hype Curve? 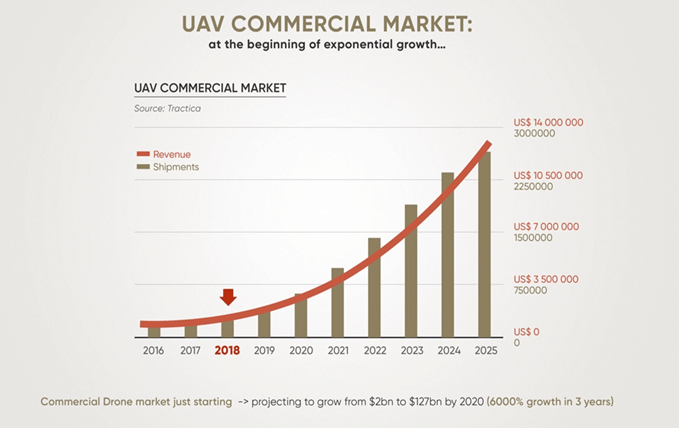 It generally appears that the UAV industry was still tentative in 2018 – but enterprise projects are beginning to scale. We seem to be nearing the end of the hype curve in 2018, and now seeing, larger implementation plans with enterprise clients that will come into effect in 2019. 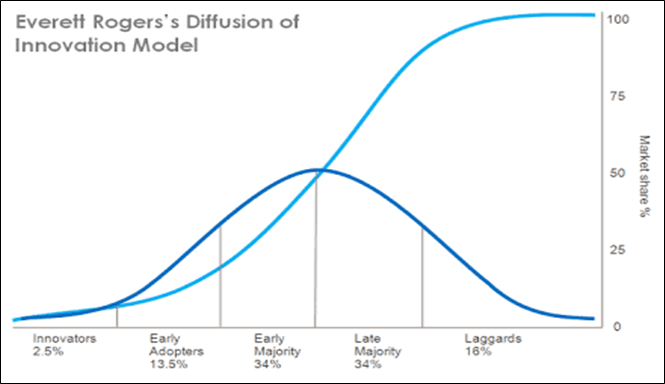 In terms of formal technology adoption curves (see diagramme) the commercial UAV market (with its long sales cycles and much more complex adoption curves seems to be moving past “Bleeding Edge” and “Fast Follower” phases to “Early Maturity” phase. Group compares the Consumer and Commercial markets in the accompanying graphic. North America is the largest market, but Europe in particular is increasingly showing signs of being ready to adopt drone technologies in their ecosystems with the UK and France are early adopters of drone technologies. Advances on the regulatory side are allowing advances in the technology, and allowing users to push the boundaries of what drone technologies can do. 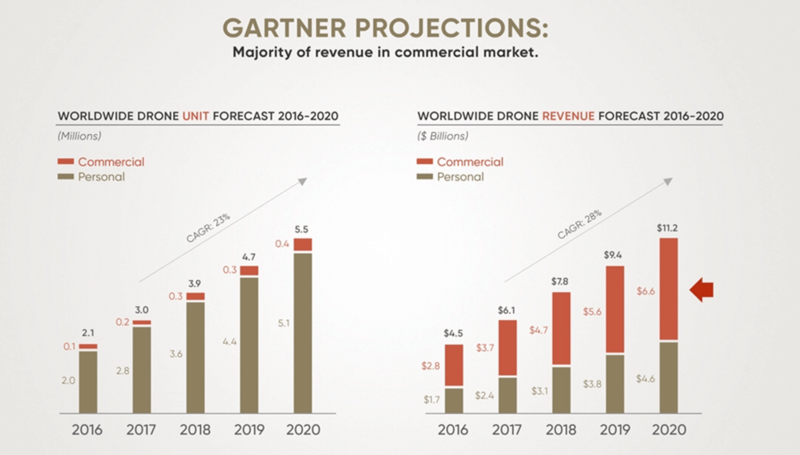 The Drone Market has also been characterized by its share of shakeouts, from acquisitions to layoffs and other failures leading the questions of why? Clearly a new market such as this will still be evolving and maturing. There is a wide variety of actual use cases not speculative anymore, and successful demonstrations. Value propositions have become clear and quantified. Today’s drone market does not only consist of are not just airborne vehicles, but also under water and land based vehicles. The wider adoption of drones seems to be moving towards industry wide, wall-to-wall, coverage of drones with very wide diversification and specialization. Hardware vs software, an old debate. – Hardware becomes a commodity item and the value added layer is located within the software layer. Modern day IT Architecture trends where processing and intelligence is pushed to the ‘edge’ (edge computing: routers, switches, IOT), results in the hardware platform coming with the ‘value added layer’. While the value adding drone services has not yet taken off we are seeing broader reseller channel adoption is more and more players are seeking entry into the market. Drones remain topical for many support industries like academics and the press who are always looking for research projects or articles on the subject. Part of broader technology waves with unpredictable trajectories. The maturing nature of the market is further evidenced by the publication of an ISO standards draft. So here goes some of the trends Airborne Drones sees developing in the drone market. Drone platforms are evolving to have embedded AI, replacing traditional professionals like quantity surveyors. Drones will be sold as stand-alone systems, ie. ‘Drone-in-a-Box’. There is a return to in-house structures as organizations are increasingly looking to take control of their own drone operations. AIRBORNE DRONES REPORTS ON: HOW DRONES ARE SPEEDING UP DUBAI DOCUMENTS DELIVERY.